Marimba classes are offered to adults and children for a 32-week period over three terms beginning in September. Mbira lessons are offered on a class by class basis. 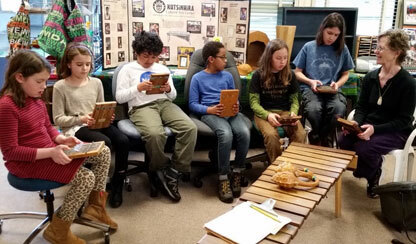 If you are interested in joining a marimba or mbira class contact Education Director Sue Dickman. Tuition for Kutsinhira members is $150 and $170 for non-members; a yearly membership (which runs from September to August) is $40 for an individual and $65 for a family. Membership provides reduced tuition for classes and workshops, plus newsletters, email notification of events, participation in our annual membership meeting/party, discounts on CDs, t-shirts, concerts, etc. Beginning classes are not offered every term of the year. Accommodations can be made to enroll new players in on-going classes with private tutoring and free observations in those classes. To be added to a list of interested students or get information about enrolling in on-going classes or private tutoring contact Education Director Sue Dickman. With other questions feel free to contact Executive Director Gary Spalter. We hope to see you in class soon!